Hi everyone! Happy Friday! Well I'm really excited for today's post I have a special mani swap with one of my top favorite bloggers, nail artist and my good friend Alice from One Nail To Rule Them All. If you don't know who she is, then your missing out! 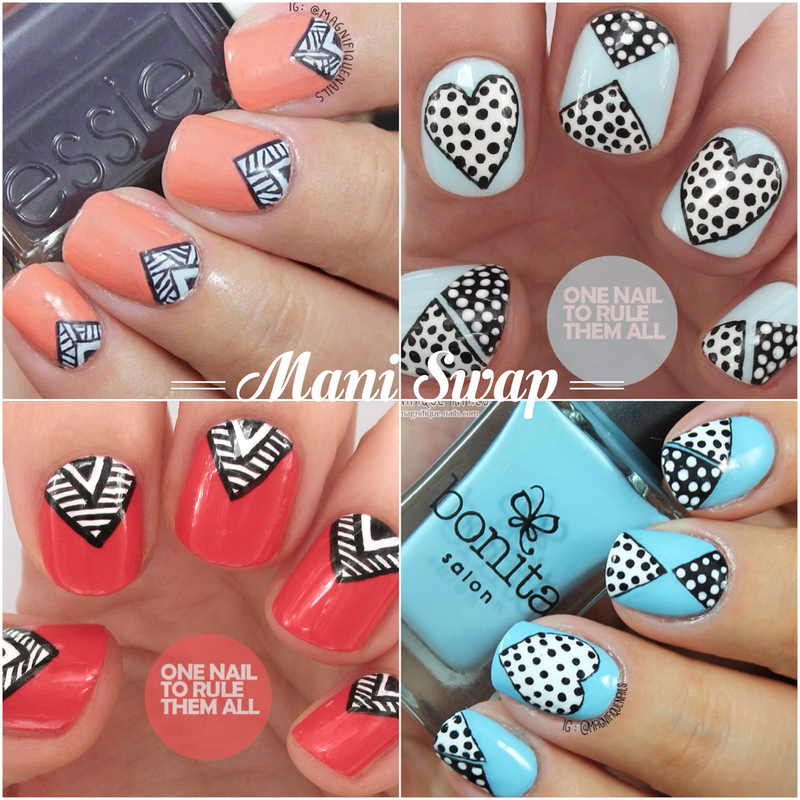 She does super cute nail art designs and, of-course, for all nail types, especially nubbins. And what do know it goes for today's 31 Day challenge, blue nails. I honestly did not choose this design specifically for the days challenge, it was more for the design, and the color. I've done a design more like this before, but it's completely different and new. For the base I applied two coats of Bonita Salon Juvia. Once the polish was completely dry, I freehand the heart on the ring finger, with white acrylic paint. Then I added black dots and outline, with black acrylic paint. Using the same acrylic paints, I freehand the triangle shapes on all of the nails, and added polka dots with a dotting tool. Lastly, I sealed the design with H K Girl Top Coat. Overall I really loved how these came out.. 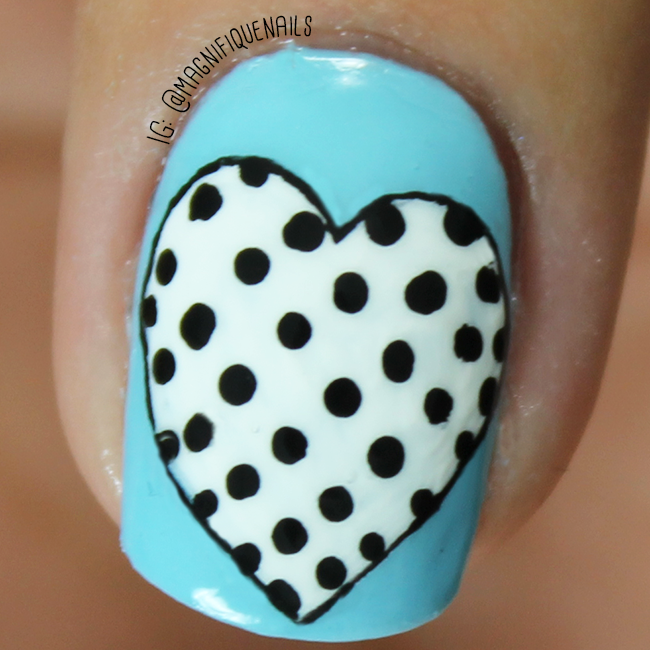 I just love this design and the color combo, especially the heart!this has to be my top favorite this year. Even though I loved the design, I couldn't help to swatch the color by itself. This has to be my favorite color from Bonita Salon, of-course, as I'm sucker blue shades. This is Juvia- a beautiful pastel baby blue creme polish. The formula is amazing, with just two coats is fully opaque. 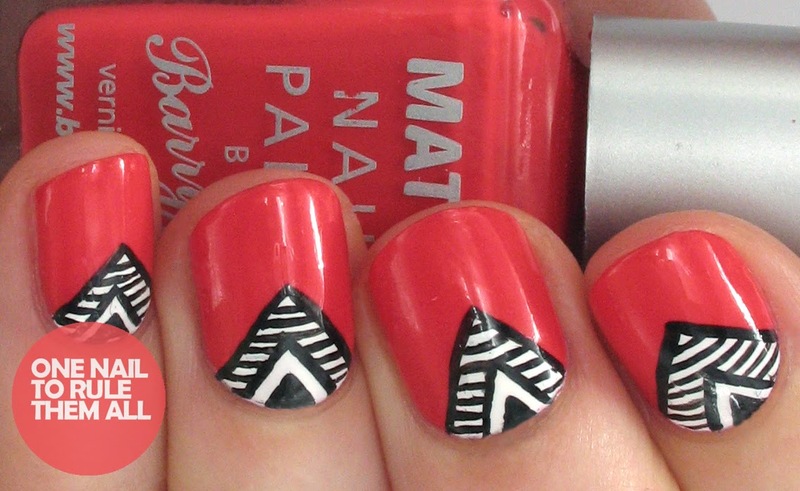 Above is the solo shot of Alice's recreation of my Tribal nails (check for her post here), and they look amazing! She did a beautiful job! I'm so happy to have done this with her, she is such a talented artist with amazing nail art designs.